First of all, Happy Deepavali! I hope that the festival of lights this year will mark the beginning of a new phase of optimism for each one of you. I know some Hindu will be celebrating the festivals of lights today, some tomorrow and some for this whole week; well it doesn't matter when you are all celebrating it, I just want to wish you all very best. Recently, I am not sure if you have noticed but lately the weather has been playing tricks on me. With cool morning, warm lunch, hot evening & freezing nights! Overall, even with all the bipolar issues with the weather I final got an opportunity to do another "Now Wearing" segment. 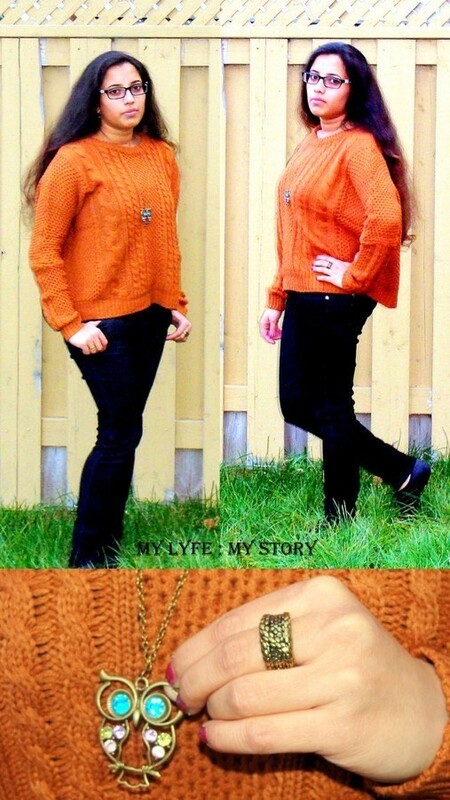 This time around I will be featuring my latest fashion craving, chunky sweaters. Recently, I have been wearing sweater a lot. I find them extremely easy to pair with any outfit and it makes my mornings seem more faster. I hope you all enjoyed my new "Now Wearing" segment and this is my second post for this segment. PS. Same as last time don't mind my eyes, I have been working on my essay all night. Also, the lovely members of Choies gave me a discount code to share with you all. So, spread the word to your friends, to tell this to their friends and tell their friends’ friends about this amazing offer . Take care & have a marvelous Monday! The color of the jumper looks great on you :) ! You look great! I love your sweater and necklace! love the orange pullover dear. Hi sweety, thanks for stopping by, this is such a great vibrant colour on you, looks lovely! i also love chunky sweaters!! I love this chunky knit! Happy Deepavali or Diwali to you too! Are you really Sri Lankan? If yes, that's so cool! Are you really Sri Lankan & Tamil? I can;t believe it? Love your outfit and you look cute! such a pretty color,and I liked the lil owl pendant too ! I tried posting a comment before on your post of my drawing but it did not show post comments, so I am glad I can do it now! This reminds me of my orange sweater! Great sweater and great colour! Love the orange sweater! The owl pendant is cute! Thanks for hopping to my blog dear. i love that owl necklace--it is adorable! Love orange on you! You look gorgeous! Great jumper! Orange is my favourite colour! very cute, love the owl! Carinissimo il maglione (: Reb, xoxo. Love your sweater, that looks so cute! omg i love that orange sweater you are wearing! such a great and happy color! Love this color! And love your owl necklace! Hope you are enjoying the festival! Such a gorgeous outfit, I love that sweater!